The good news is that the economy created 244,000 new jobs, the biggest gain in almost one year. And the jobs were in the productive sector of the economy rather than government, so the added employment means more taxpayers rather than more tax-consumers. The bad news is that the jobless rate increased to 9.0 percent, up from 8.8 percent last month. This means that the number of people looking for work is increasing at a faster rate than the number of jobs being created. The ugly news, at least from the perspective of the Obama Administration, is that the latest data is yet another piece of evidence showing that the White House was grossly mistaken when it claimed that bigger government would translate into better economic performance. The blue line in this chart shows the Administration’s prediction of what would happen to unemployment if the so-called stimulus was enacted. The dots represent the actual unemployment rate. As you can see, the unemployment rate is easily more than two percentage points higher than the White House said it would be at this time. Administration apologists respond by moving the goal posts, asserting that the original prediction underestimated the economy’s weakness and the unemployment data would have been even worse in the absence of more wasteful spending. Since economists are lousy at predicting the future, that’s a legitimate argument. But is it an accurate argument? Since there’s no parallel universe where we can conduct policy experiments, there’s no way of proving which side is wrong. 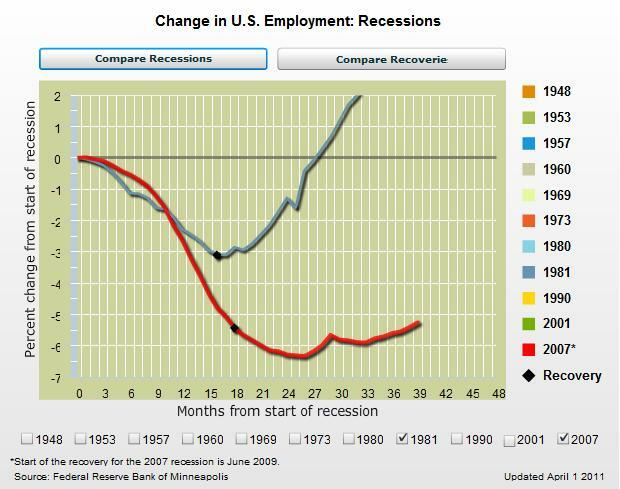 Nonetheless, this chart from the Minneapolis Federal Reserve Bank is rather revealing. It compares employment numbers after the deep recession of the early 1980s with the employment numbers from the recent deep recession. Perhaps I’m biased and reading this chart incorrectly, but it certainly seems as if Reaganomics generated better results than Obamanomics. Maybe it’s time to realize that government is the problem, not the solution? 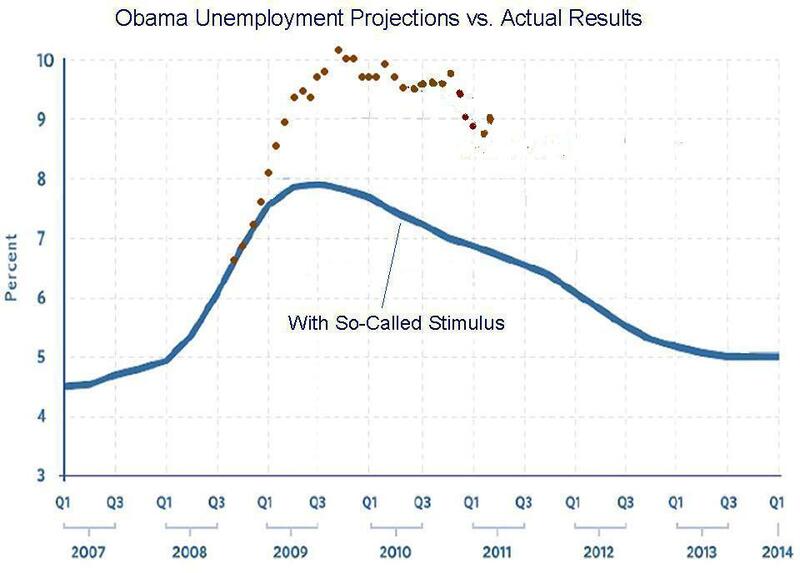 on May 9, 2011 at 1:05 pm Sean L.
I love the “Obama Unemployment” chart. I think the one that includes the “do nothing” line is even more striking. That their activities in an attempt to ‘fix’ things made them worse than their own worst-case scenario speaks volumes. on May 7, 2011 at 10:07 am Art R.
Daniel, you’re forgetting about all of the jobs that the stimulus money created in those economies (mainly China) where our consumer products are manufactured and where the stimulus money eventually wound up. As a globalist, you should be right proud of the accomplishment.